The Corsair 31 Ultimate Cruiser combines performance with the ultimate in cruising accommodations. The forepeak area houses the head, shower, wet /dry storage & hanging locker. This alternative interior layout allows for a full salon & aft cabin interior that is without obstruction. 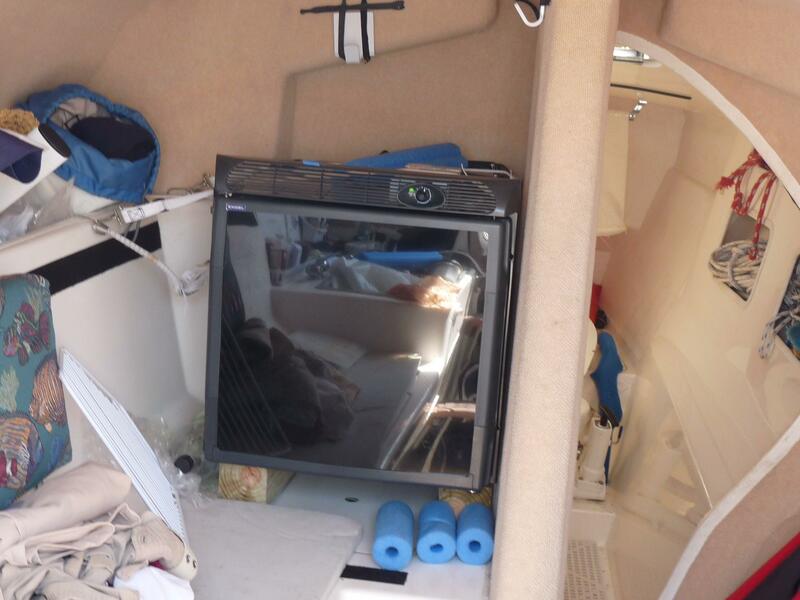 The Corsair 31 UC has full standing headroom, pressurized water system. As easy to trailer, beach & sail as her sisters, the Corsair 31 Ultimate Cruiser is the perfect boat to sail away on for a week, a month, or more. 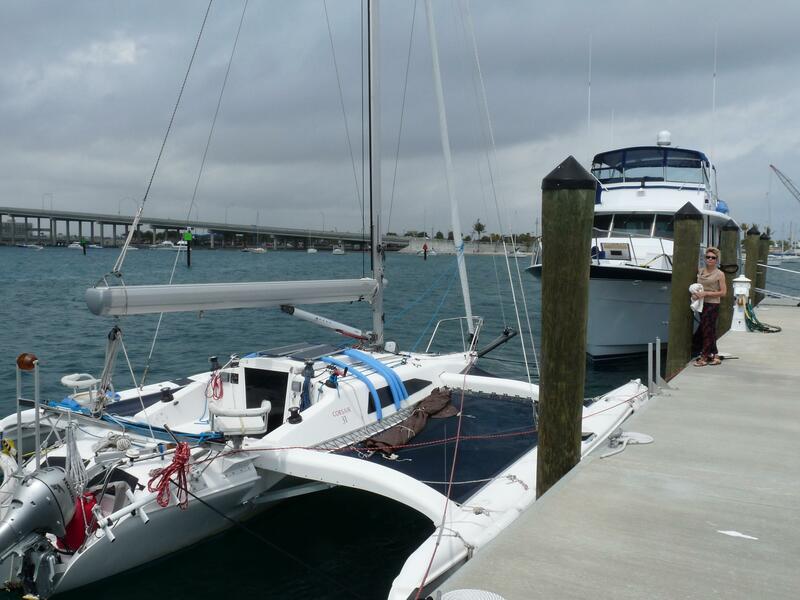 BOOM FURLING MAIN – Unique, Customized “Leisure-Furl”-brand internal-furling boom with aluminum shell, $25,000 value. UNIQUE – a 4th winch, electric. The power winch in conjunction with the boom-furler provides for fast, safe and easy mainsail raising and furling, by one person, at the touch of a button (can also be used with bosun’s chair (included), mast raising, and lifting the amas using the spinnaker halyard). Brand new rotating mast, Oct. 2017, never used since, fully newly rigged. 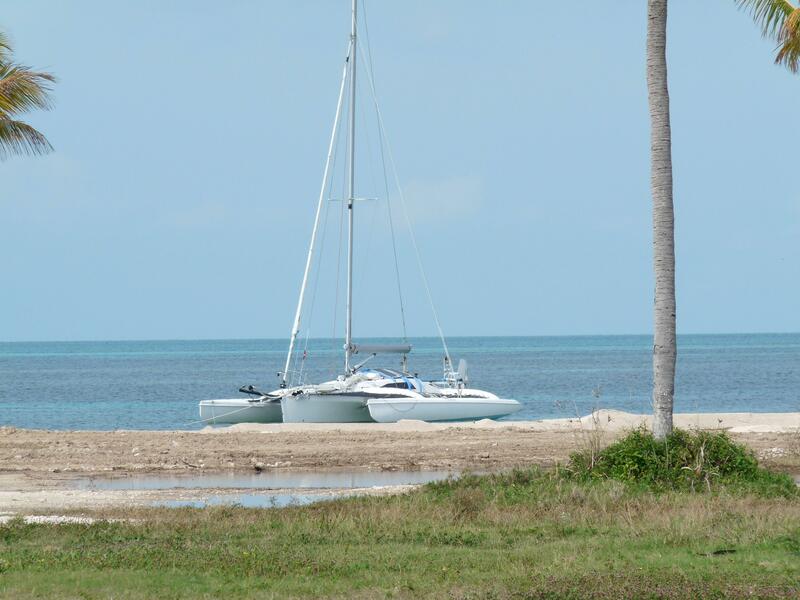 Includes new main sail track, new cleats, new lines, brand new Anchor Light, Steaming Light, Deck Light, and masthead VHF antenna. GPS Antennas: Two (2) Standard Horizon antennas, one mounted at the stern, one at the mast base for mast-rotation compensation. A third GPS antenna for the Garmin is mounted at the stern. Dual hook-up connections for Std. Horizon and Garmin chart-plotters. The mast comes with a Brand New eye-popping racing-class carbon-fiber WIND TRANSDUCER ($1200 value) and brand new WIND DISPLAY (ComNav/Garmin). The cables need to be plugged into the display. 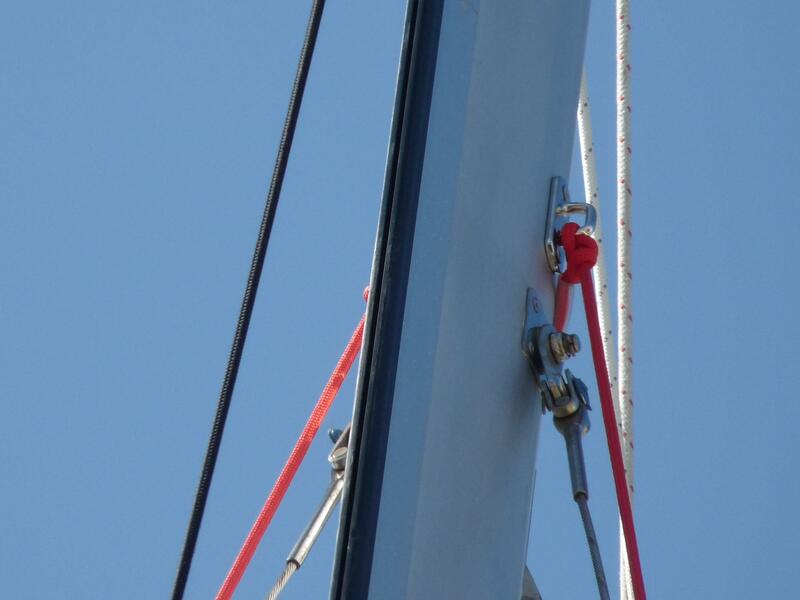 New standing rigging (new stays) 2015, with rotating shackles on jib and stays, to remove the hazard of metal fatigue on the original design (due to rotating mast). Duplicate (adjustable) stays for additional security. Custom-made mast-raising equipment: 2 Ball-Bearing rollers (fore and aft). 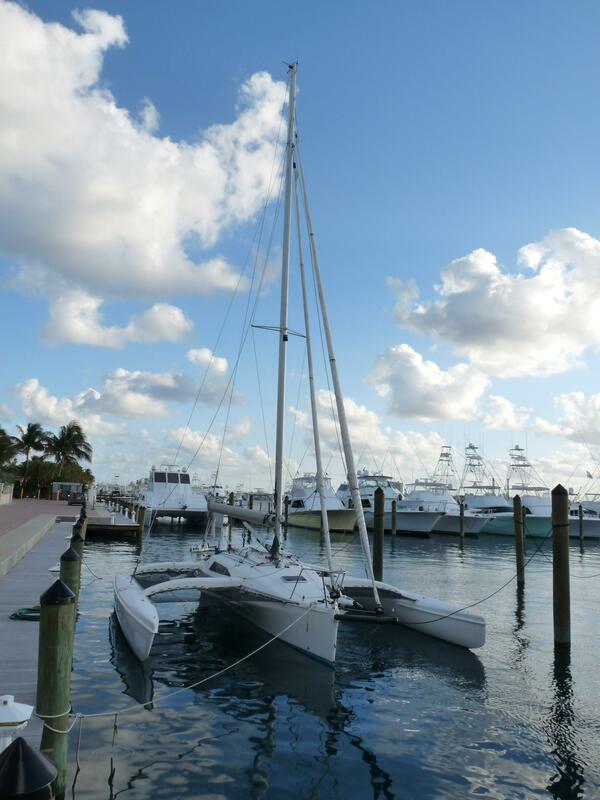 The forward one stands on a portable solid, wood base, with custom-built jack raising equipment, so that the mast can easily be lifted and rolled from the trailering position to the mast-raising position by one person. UNIQUE custom-made aluminum boom cradle for trailering, with a stainless steel deck eye (thru-bolted) at forward end. 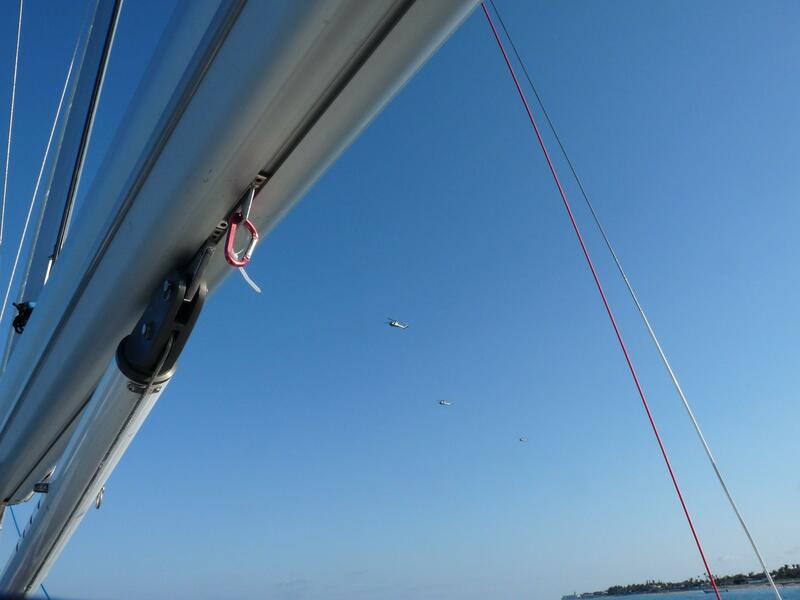 Boom can be mounted/dismounted using the halyard and power winch, without you having to lift it. Aft mount converts to pedestals for rotating chairs. Two Custom-built stainless-steel rotating chairs give you a higher sight-line for more enjoyable sailing. UNIQUE – rigged for bow thruster for “turn-on-a-dime” maneuverability, allows docking anywhere, any conditions. Custom Mount Platform (powder coated) for tilt up & down Minn Kota electric motor with Remote Control. (Motor sold separately) (See photos). 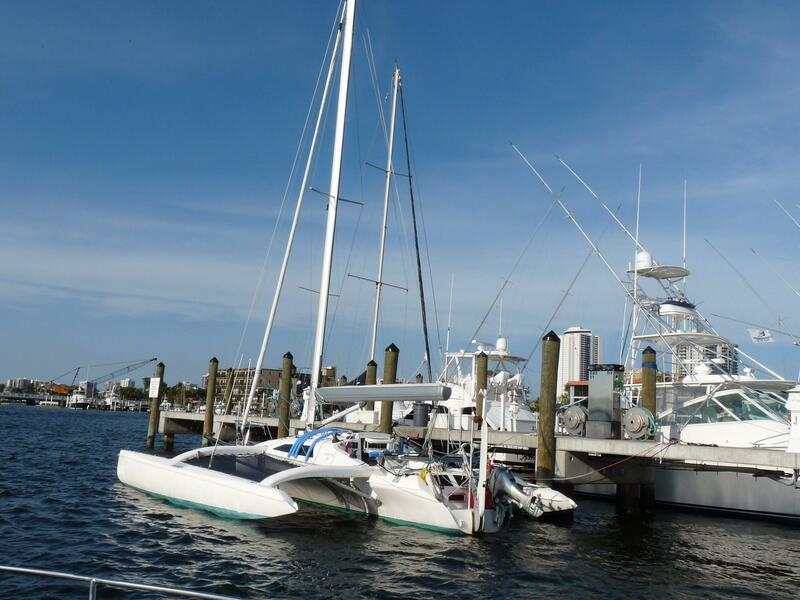 Heavy-duty VANG to accommodate the Leisure Furling boom. 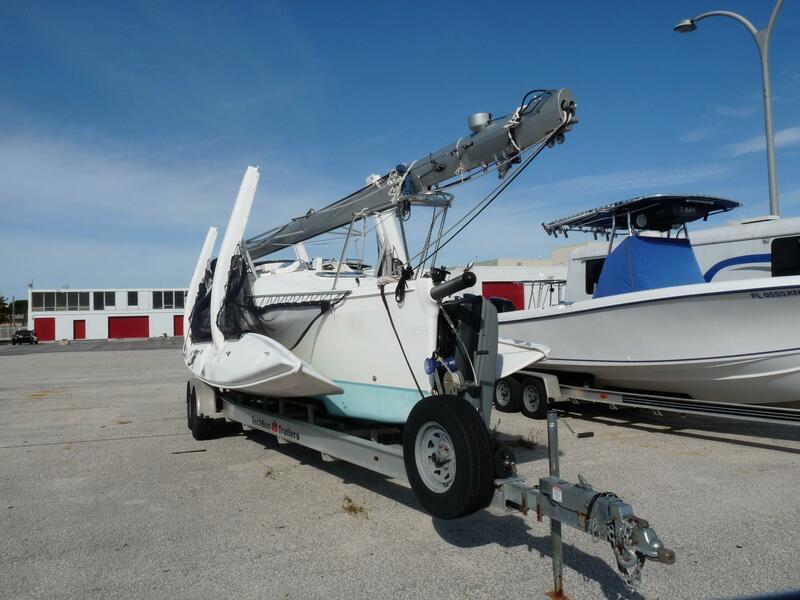 Topping lift: Brand New adjustable boom TOPPING LIFT with Harken cam cleat. AUTO PILOT: Ray Marine auto pilot with remote control for hands-free steering under power and under sail. E-Z STEER LINK for steering engine and rudder in tandem, whether by tiller or by auto-pilot (Custom-engineered and built mounting brackets). SOLAR PANEL MOUNT: Removable Custom, 360 degree swivel and tilt, powder-coated mount for Solar panels using aft mast support, wired to Balmar, with regulator to protect against over-charging (solar panels not included). VHF RADIO: Standard Horizon radio, with GPS location alarm button, plus external remote speaker to be installed.